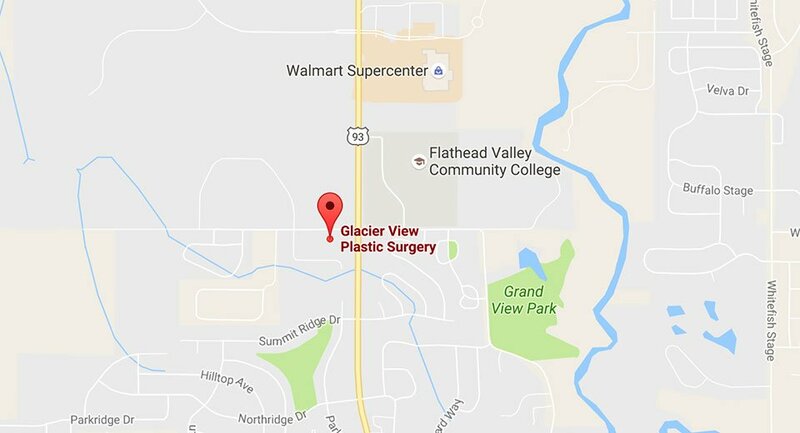 In Kalispell and Whitefish, the board-certified plastic surgeons at Glacier View Plastic Surgery offer advanced abdominoplasty techniques, such as the “no-drain” tummy tuck, which you may have thought were only available in larger metropolitan areas. A tummy tuck creates a flatter, more toned abdomen by removing excess skin and repairing and tightening abdominal muscles separated by pregnancy. Because of their advanced training with this procedure, Dr. Michelle Spring and Dr. Michael Hromadka see tummy tuck patients from Bozeman, Missoula, and Helena, MT; Spokane, WA; Canada; and beyond who are willing to travel for superior results. To find out if a tummy tuck is right for you, request a consultation using the online form or call our practice at (406) 756-2241 to schedule an appointment. It’s important that your weight is stable and that you are within about 10 pounds of the weight you intend to maintain before undergoing abdominoplasty. Our surgeons often combine liposuction with tummy tuck surgery, but the operation is not a weight-loss procedure. Gaining or losing a significant amount of weight after a tummy tuck can compromise the results. Some patients may be good candidates for a more limited abdominoplasty, usually called a mini tummy tuck. These operations involve a shorter incision, but the cosmetic improvements are limited to the area below the belly button. The only way to know if you would benefit from this procedure is consulting with a plastic surgeon. A tummy tuck begins with either Dr. Spring or Dr. Hromadka making an incision just above the pubic area that spans from hip to hip. They make it as low as possible so it can be concealed by underwear or bathing suit bottoms. For a full abdominoplasty, your surgeon makes a second incision around the belly button. The surgeon uses the access to the abdominal area to repair muscles weakened by pregnancy, if necessary. After that, the skin is pulled down and any excess is removed. During a traditional tummy tuck, the surgeon places surgical drains to help remove fluid that can accumulate in a space created when the incision is sutured. When fluid accumulates, called a seroma, it can lead to an infection or other complications. Surgical drains often must remain in place for a week or more following tummy tuck surgery. Our surgeons often use an advanced technique that eliminates the need for surgical drains. While they serve an important purpose, surgical drains can be an uncomfortable and cumbersome part of your recovery. Instead of drains, Dr. Spring and Dr. Hromadka use internal stitches (“progressive tension sutures”) or an FDA-approved abdominoplasty surgical glue to eliminate the empty space where fluid can collect. These techniques improve the recovery process by minimizing the discomfort and inconvenience associated with drains. A mini tummy tuck is a modified version of the traditional abdominoplasty. This procedure is performed to get rid of excess skin and fat below the belly button. It is most commonly performed for patients who only have excess skin below the belly button and have good skin elasticity. A mini tummy tuck involves a smaller incision and less recovery time than a complete tummy tuck. Body contouring surgery such as a tummy tuck may be combined with other cosmetic procedures if desired. Women who have had children may choose to have breast augmentation or a breast lift performed at the same time to restore the appearance of the breasts after breastfeeding. Combining cosmetic breast surgery with a tummy tuck and liposuction is often referred to as a mommy makeover . This is an option you can discuss with Dr. Spring or Dr. Hromadka during your consultation. A tummy tuck is a major operation and you should arrange to have help around the house for at least a week or so, especially if you have young children at home. You need to avoid lifting anything heavy, including children, during much of the recovery. Dr. Spring and Dr. Hromadka provide detailed postoperative instructions to their patients to help minimize discomfort and promote the healing process. That includes wearing a tight-fitting, compression garment which helps reduce swelling. Getting enough rest is important, particularly during the first week after the procedure. Taking short walks, even just around the house, helps ensure good blood circulation. Expect to take 2 weeks off work. If your job requires strenuous physical activities, the time off will be longer. By week 3 after the operation most patients are feeling good and carrying out their normal daily activities, such as running errands. Our surgeons usually tell patients that they can resume their regular exercise routine at about 6 weeks after the surgery. Even then, you should expect to gradually work your way back into your pre-surgery physical shape. The compression garment is usually worn for 4 to 6 weeks. A tummy tuck produces results that can last for years, as long as you maintain a healthy lifestyle and keep your weight relatively stable. You will have a flatter abdomen and a slimmer waist, and should feel more comfortable in lower-rise pants, bathing suits, and other fitted clothing.